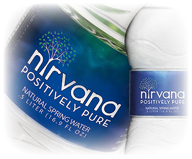 Nirvana Natural Spring Water has elected to go with iGPS Company, LLC. and its RFID-enabled all-plastic pallet platform for shipping its products throughout North America. Cutting back on the environmental footprint, iGPS’ lightweight all plastic pallets are 100% recyclable and are 30% lighter than wood pallets. Also within the pallets are embedded RFID tags, which enable shippers and receivers to track shipments throughout the supply chain. They do not shrink, warp or contain protruding nails and splinters that can lead compromise products, injure workers or damage equipment. Additionally, the pallets do not absorb fluids that can cross-contaminate food and, because they cannot harbor wood-boring insects, never require treatment with toxic pesticides or fungicides.